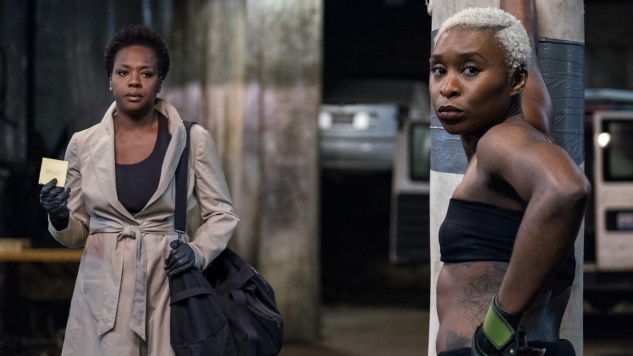 With its stellar cast, everyone and their mother will be heading to the theaters this fall to see Widows, the new film from Gone Girl author Gillian Flynn and Academy Award-winning director Steve McQueen (Twelve Years a Slave). The two teamed up to co-write the screenplay based on the Lynda La Plante novel Widows. McQueen is also directing. At the core of Widows is, naturally, the quartet of women united by the deaths of their criminal-minded husbands. Viola Davis (How to Get Away with Murder, Fences), Michelle Rodriguez (Fast & Furious franchise), Elizabeth Debicki (The Great Gatsby, Guardians of the Galaxy Vol. 2) and Cynthia Erivo (Broadway’s The Color Purple) star as these peculiarly fate-bound women. When the film’s first trailer arrived earlier this summer, viewers got a taste of the women’s backstories and a glimpse at how they are taking their fates into their own hands. Today’s second trailer shows the evolving dynamic between the women as they prepare to run the next job Veronica Rawlins’ (Davis) husband (Liam Neeson) planned—one that Rawlins says no one thinks they have the balls to pull off. Davis stars as the de facto leader, Rawlins, who pushes down her heartache to save herself and her fellow widows through their approaching job. Get ready for an action-packed heist. Also among the cast with the leading ladies is the aforementioned Neeson, along with Colin Farrell, Robert Duvall, Daniel Kaluuya, Lukas Haas and Brian Tyree Henry. See if all the characters reap what they have sown when Widowscomes to theaters on Nov. 16, and check out the new trailer below.